Background: Glioblastoma multiforme (GBM) is the most aggressive and malignant primary brain tumor characterized by rapid growth and extensive infiltration to neighboring normal brain parenchyma, which contribute to tumor recurrence and poor prognosis. Myricetin is a natural flavonoid with potent anti-oxidant, anti-inflammatory and anti-cancer activities, which may serve as a potential and harmless agent for GBM treatment. Methods: To investigate the anti-glioblastoma effects of myricetin, GBM cells were treated with myricetin alone or in combination with temozolomide. Its effects on GBM cell motility and cytoskeletal structures including lamellipodia, focal adhesions and membrane ruffles were also evaluated. Results: We showed that myricetin alone inhibited glioblastoma U-87 MG cell proliferation, migration and invasion, whereas combination of myricetin and temozolomide did not exhibit any synergistic effect. The inhibitory effect on GBM cell proliferation is independent of PTEN status. Moreover, myricetin showed less cytotoxicity to normal astrocytes than GBM cells. Formation of lamellipodia, focal adhesions, membrane ruffles and vasculogenic mimicry were blocked by myricetin, and phosphorylation of ROCK2, paxillin and cortactin was suppressed. 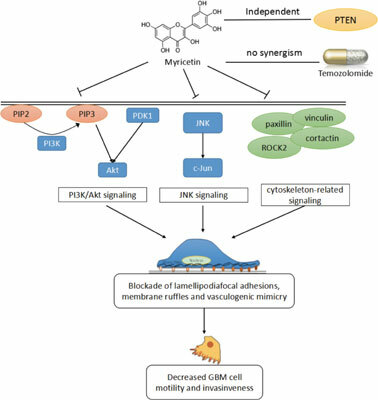 In addition, myricetin could inhibit PI3K/Akt and JNK signaling, and bind to a series of kinases and scaffold proteins including PI3K catalytic isoforms (p110α, p110β and p110δ), PDK1, JNK, c-Jun, ROCK2, paxillin, vinculin and VEcadherin. Conclusions: In conclusion, myricetin is a multi-targeted drug that has potent anti-migratory and antiinvasive effects on GBM cells, and suppresses formation of lamellipodia and focal adhesions, suggesting that it may serve as an alternative option for GBM treatment. Keywords: Myricetin, glioblastoma, motility, invasiveness, lamellipodia, focal adhesion. Keywords:Myricetin, glioblastoma, motility, invasiveness, lamellipodia, focal adhesion. Abstract:Background: Glioblastoma multiforme (GBM) is the most aggressive and malignant primary brain tumor characterized by rapid growth and extensive infiltration to neighboring normal brain parenchyma, which contribute to tumor recurrence and poor prognosis. Myricetin is a natural flavonoid with potent anti-oxidant, anti-inflammatory and anti-cancer activities, which may serve as a potential and harmless agent for GBM treatment.